Coral Sportsbook is one of the oldest bookmakers as it has been present in the UK gambling market ever since 1926. They are one of the most popular gambling destinations within the European island thanks to their long-lasting history. They have been present in the online gambling market since 2004. Coral Sportsbook mainly offers its services to sports betting enthusiasts from the United Kingdom. The website of the well-known online sportsbook is only available in English, and we can only play with either British Pounds or Euros. In addition, players from the United States and from Israel are not allowed to wager with real-money. However, the sports betting options at Coral Sportsbook are rather fascinating. 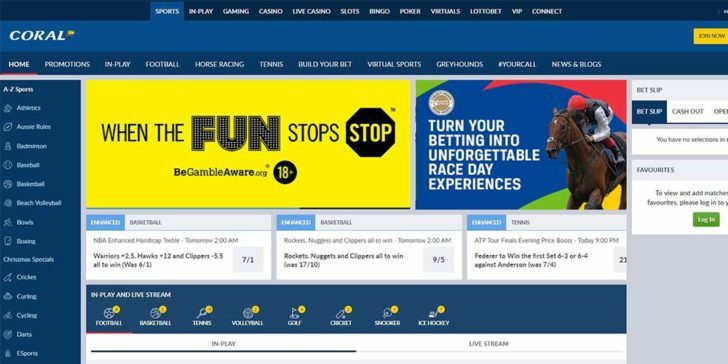 We can wager on the most common sports such as football, ice hockey, basketball, handball or tennis, but we can find more unique offers, such as rugby, greyhound racing, snooker or athletics as well. In addition, new customers of the popular Coral Sportsbook can also enjoy the great welcome bonus of GBP 20 when you bet £5 (18+. UK+IRE customers. Deposit % player restrictions. Min £5 bet within 14 days of account reg at min odds 1/2=4x£5 free bets valid for 7 days on sports, stake not returned, no cashout or single bets. T&Cs apply). Loyal members of the online bookmaker are also greatly rewarded with beneficial promotions regularly. £50 Welcome Bonus Bet £5 Get £20 Free Bet Play! England v Costa Rica Betting Offer: 33/1 Odds for a Goal to be Scored Play! Claim GBP 20 UK Sportsbook Welcome Bonus at Coral Sportsbook! Play! Win up to GBP 100,000 Every Week on Coral’s Football Jackpot Game Play! Coral Sportsbook Offers the Best Odds For Arsenal vs Hull Play! Enhanced Special Betting Odds for New Players at Coral Sportsbook Play! Take Advantage of Coral’s Best Odds for Chelsea to Win Against Leicester City Play! Take this Crazy Liverpool v Stoke Enhanced Odds Betting Offer at Coral Sportsbook! Play! Win £30 with This Liverpool Enhanced Odds FA Cup Safe Bet Offer v Exeter at Coral! Play! Back West Brom to Win with 11.00 (10/1) FA Cup Safe Betting Odds at Coral Sportsbook! Play! Win £50 with Your Selected Team with this Liverpool v Man Utd Safe Bet at Coral Sportsbook! Play! Bet with Man Utd Enhanced Odds vs Newcastle at Coral Sportsbook! Play! Back Barca & Bayern with a Champions League Enhanced Odds Safe Bet Today and Make £40! Play! Win £50 with the Best Premier League Safe Bet this Weekend at Coral Sportsbook! Play! Win Big with the Black Friday Promotion at Coral Sportsbook Play! Go for the Acca Insurance for Free Bets at Coral Sportsbook! Play! Back the Three Lions with the Best England vs France Odds and Win GBP 50 at Coral Sportsbook! Play! Bet on Ibrahimovic to Score vs Denmark with odds of 11.00 (10/1) at Coral Sportsbook! Play! Find the Best Norway vs Hungary Odds at Coral Sportsbook! Play! Check Out the Best Odds for Manchester United vs West Bromwich Albion Play! Bet with 7/1 Man Utd Enhanced Odds vs CSKA at Coral Sportsbook! Play! Bet on a Standing Ovation From Simon Cowell with Coral and Win Cash Whether You Win or Lose! Play! Coral Sportsbook Has the Best LeBron James Odds Offer in the First Week of the NBA Season! Play! Win Big on Tottenham vs Liverpool Safe Bet with Enhanced Odds at Coral Sportsbook! Play! Cash Out in Fashion with Rugby World Cup Safe Bet for Enhanced Odds at Coral! Play! Enhanced Horseracing Odds at Coral Sportsbook! Play! Man United vs Wolfsburg Promo has Great Odds and Free Bets at Coral Sportsbook Play! Enjoy USPGA with Coral Sportsbook Promos Today! Play! Coral Sportsbook Dishes out Cool Offer for West Brom vs Man City Game Play! Big Premier League Coefficients and Free Bets at Coral Sportsbook! Play! Wager on FC Barcelona for 9.00 (8/1) Odds at Coral Sportsbook Play!